Hyrule is in peace until Princess Zelda awoke to a premonition of evil. She walks the training ground walls of the Castle spotting Link believing him to be the hero reincarnated. Shortly after, the castle is attacked by Moblins and Link joins Zelda’s army to defend Hyrule. The army meet young sorceress Lana who informs them that the evil sorceress Cia is plans to break the four seals that hold Ganon’s soul. Link and his allies have to fight this war not only in Hyrule but in different worlds from the past. Hyrule Warriors is a Dynasty Warriors style of game. Levels take place in large battlefields occupied by thousands of enemies and allies. Each side fights for Keeps and Outposts that produces support for the controlling team. You fight taking Keeps and defeating enemies until the enemy leader appears for a showdown. There are 13 characters, each has their own fighting style and moves but they all use similar button combos. Characters have light and heavy attacks with the amount of light attacks changing the heavy attack ender. Captain and bosses sometimes reveal a Weak Point Mark after an attack. If you deplete the mark you will perform a Weak Point Smash for heavy damage. Characters have a Special and Magic gauge. Special gauge fills through fighting and Triforce pickups. Special attacks are strong and usually wide hitting moves. The Magic gauge only fills with Magic Jar pickups. When filled and activated, you trigger Focus Spirit, increasing your attack speed and breaking enemy defenses. The gauge slowly depletes but will increase and grant bonuses before ending with a final strike. Legend Mode is the game’s story. You play through levels, with the game recommending and at times forcing a variety of characters. Through here, you’re introduced to most of the cast, equipment and weapons. Hidden in each level are Heart Pieces and Containers that increases health but only obtainable by a specific character. Gold Skulltulas which unlocks artwork appears after killing 1000 enemies in a level. They appear in a large radius on your map forcing you to search for it before it flees. Free Mode is Legend Mode but with no character restrictions for levels. However, you cannot advance the story in Free Mode. Adventure Mode uses the original Legend of Zelda Map with each screen containing a different mission. Here, you can unlock new characters and new weapons as well as Heart Pieces, containers and Gold Skulltulas. Some rewards require the use of specific characters to obtain. You can search for secrets to unlock access for rewards. These secrets requires items like bombs or candles which are obtained after completing which ever screen they’re displayed on. If you’re connected to the network you can encounter Network Links which increase the difficulty of a mission but yields better items and Friend Links which can give people on your friends list items. Throughout the story you acquire equipment useable by all characters. Equipment like Bombs or the Hookshot are used both for combat and interacting with the level. Captain class enemies usually have a weakness to one of the items and giant bosses require the uses of items to defeat effectively. You equipment is also used to reveal hidden objects or access new areas in the levels. Materials and weapons are dropped by non-standard enemies. They’re used to upgrade your characters. Materials are used for making potions that give passive benefits for the next level and crafting badges which increases your characters’ fighting capabilities, defensive benefits and equipment upgrades. Some characters have different weapon types that change their fighting style while all characters have several multiple weapons for each type. Each weapon is standardized but they can come with stars which increases its strength or slot and abilities. In the Smithy you can combine weapons if they have empty ability slots and pass one ability on from a different weapon. The Training Dojo allows you to spend Rupees to level up a lower level character up to your highest leveled character, with the price increasing each level. There is local co-op with one player using the Gamepad and the other using the TV with no split screen. 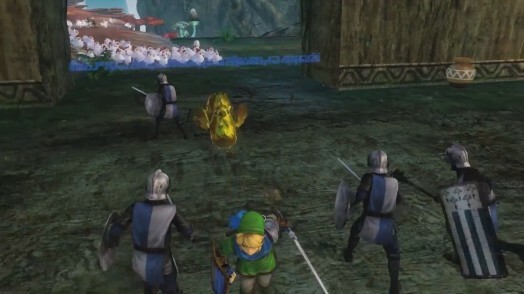 Hyrule Warriors blends Twilight Princess’s and Skyward Sword’s visual styles. Characters look more realistic but still cartoony with their bright and vivid colors. The enemy designs lifted and touched up from their source game. This leads to some clashing of visual when the cartoony enemies meets the more detailed characters. The giant bosses and certain characters have updated designs but are still recognizable. I’m fire-breathing and gold, what do you got. The animations and fighting moves are fantastic. A lot of work and thought was put into the characters, tapping into their more subtle and under utilized aspects to create fighting styles. The Weak Point Smashes are flashy and satisfying, especially against the giant bosses where the attacks will differ between each character. There are also tons of characters and enemies on the screen at once. It really give you the feeling of epic battles. Playing off the Gamepad isn’t ideal because of the amount of the smaller size and the amount of things happening on the screen. You get used to it but the minimap isn’t great for displaying characters among the cannon fodder. This is a Zelda game so there isn’t any character voice acting but there is a narrator. It was jarring to hear for a few reasons. One, there is actually voice acting in a Zelda game and two that it’s a narrator that isn’t an older British man speaking it. The game uses several sound effects from the series like item and treasure pickups and the sounds from combat. The soundtrack has several remixed tracks that make them more upbeat and is inline with the other Warriors games. The soundtrack also sports several soothing music fits the mood in the menus and the calmer cinematics. Hyrule Warriors is quite enjoyable. The cast of characters isn’t large but they’re designed to deal with the action the game demands. The movement is fast so traveling isn’t tedious. There are several upgrades and weapons that change the character’s play styles and makes the game more fun. She like those other princesses getting captured all the time. I’ve play a few Dynasty Warriors spin-off games recently but Hyrule Warriors stands out. The Warriors series has been refining itself to be more fun for extended periods. Weaker enemies are weaker and stronger enemies are more threatening. 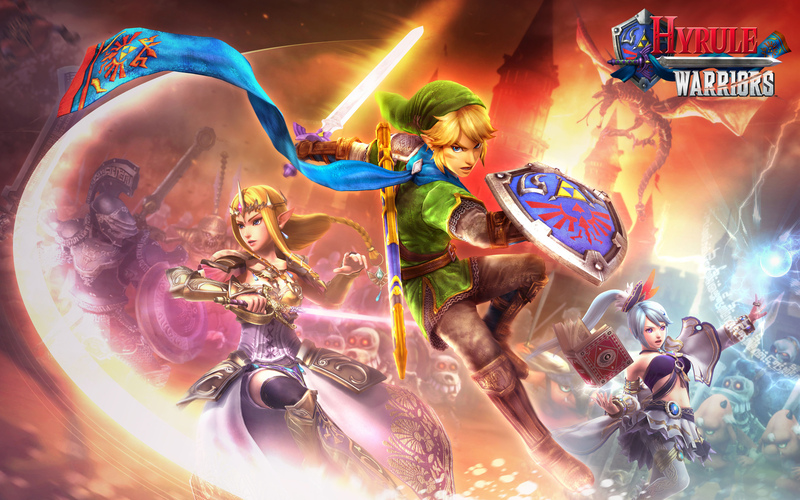 Hyrule Warriors has taken these aspects and added new elements giving the game more variety. Realistically, they haven’t added that much gameplay-wise however, it’s surprising how the little changes improve the game. The shared equipment gives more combat options and allows for exploration that didn’t exist in previous games. Weak point marks encourages you to take more calculated approaches to fights. Some enemies are very durable so the extra damage from weak point smashes is too good to pass up. Giant bosses are a great addition because it gives levels a satisfying conclusion and forces you to play differently. Attacking wildly isn’t the catch-all solution anymore. The story could have benefited by being more fleshed out. It’s bare bones Zelda story but it doesn’t feel too foreign from the main series. We revisit worlds and characters from Ocarina of Time, Twilight Princess and Skyward Sword without it feeling too forced. I would have been nice to spend more time with these characters but the focus was on Link, Zelda, Lana and the villains. characters. The format for Legend Mode levels introduces several missions that drags you around the map, leaving little downtime. Occasionally missions have strict time limits but you’re never sure. You feel obligated to attend to each missions promptly but you might forgo combat. If you leave too many enemies alive, they may cause problems even failure later on. If you get warnings across the map then it’s difficult to attend to them in time. Also levels can last 20-30 minutes average (depending on level, weapons and skill). Fortunately, checkpoints and suspending progress alleviates some of the stress and difficulty involved. Adventure Mode is a fantastic callback to fans of the original Legend of Zelda. There is a fair amount of variety and for completionists it encourages the use of the whole cast. If you continue to play the post game content then this is where you will spend most of your time, leveling and finding stronger weapons for characters. Players familiar with the secrets of the original game will appreciate that they have returned. If you have a Wii U and don’t have anything to play then yes. Hyrule Warriors is action packed and addicting. It’s a great Warriors spin-off game, if not the best. Ultimately, your enjoyment will stem from how much hack and slash you can take. Dynasty Warriors games get a lot of flak for its repetitive gameplay but Hyrule Warriors added enough mechanics to give the series more depth than any other Warriors game. Zelda fans will appreciate the call backs and it doesn’t feel blatant to non-fans. However, Hyrule Warriors hasn’t reached its full potential in terms of gameplay and storytelling. If a sequel came and improved these aspects then it would be welcome.